The Bandhavgarh Fort, believed to be around 2,000 years old, is situated in Bandhavgarh in Umaria district of Madhya Pradesh. It is located on the Bandhavgarh hill, in the centre of the Bandhavgarh National Park. One of the oldest forts in Madhya Pradesh, the fort remained under the rule of many dynasties and great kings like the Maghas, the Vakatakas, the Sengars, the Kalchuris and the Baghels. Now in ruined condition, no records remain to show when this fort was constructed. The inscriptions on the caves confirm that this was inhabited 2,000 years ago. The fort is mentioned in some hindu books like '‘Narad-Panch Ratra' and the 'Shiva Purana'. 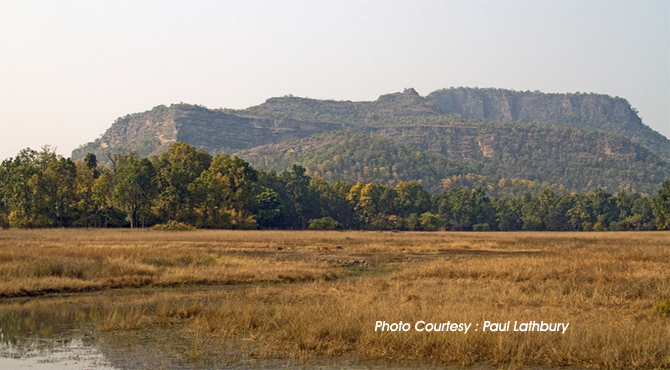 Bandhavgarh Fort derives its name from the hillock of the area and there is an interesting story behind this. In the Epic Ramayana, Bandhavgarh Fort was given to brother Laxmana by Lord Rama to keep an eye on the happenings of Lanka and hence, the name Bandhavgarh (Bandhav means brother and Garh means fort). The fort was the seat of many dynasties from 6th century onwards. In 1617 AD, the Baghel ruler Maharaja Virbhanu Singh, abandoned the fort. The Baghelas lived in Bandhavgarh till 1617 AD and then moved their capital to Govindgarh near Rewa during the reign of Maharaja Vikramaditya Singh. The Fort and the adjoining habitation (Gopalpur and Rampur) were gradually deserted and the last inhabitants deserted the fort in 1935. Now the fort is a private property of the erstwhile Maharaja of Rewa-Martand Singh. It is surrounded by a large number of smaller hills, separated by sloping valleys which end in small meadows locally known as bohera. The fort stands on an outcrop rising 811 mts above sea level. The fort blends with the wilds of the park and has become a part of the park. Along the foot path of the fort and within its walls are ruins of medieval temples and massive stone sculptures. There are amazing sculptures of the avatars to Vishnu and other gods and goddesses, palaces and ponds. Starting with the 35 foot tall Vishnu reclining on the Shesh nag, called the Shesh shaiya, flanked by a tall Shiva linga and a sculpture of Brahma which is split by the roots of a old and tall tree From the feet of Vishnu flows the Charan ganga, perennial springs that form and tributary to Son and then finally merge with Ganga. The only walls are around the few yards of the part that are accessible. There is a temple on the top, the priest is a full time employee of the Maharaja. The chief deity of this temple is Lakshman and is called the ‘Bandhavdeesh’ temple.The villagers go up on special days and bring him food and other essentials and the forest guards do the same.